An informant leaks information to the Rebel Alliance that some Imperial pilots want to defect. With resources stretched thin, Sabine must go in alone to find the would-be defectors. Kanan and Ezra wait nearby until Sabine makes contact and requests retrieval for herself and the badly needed new recruits. 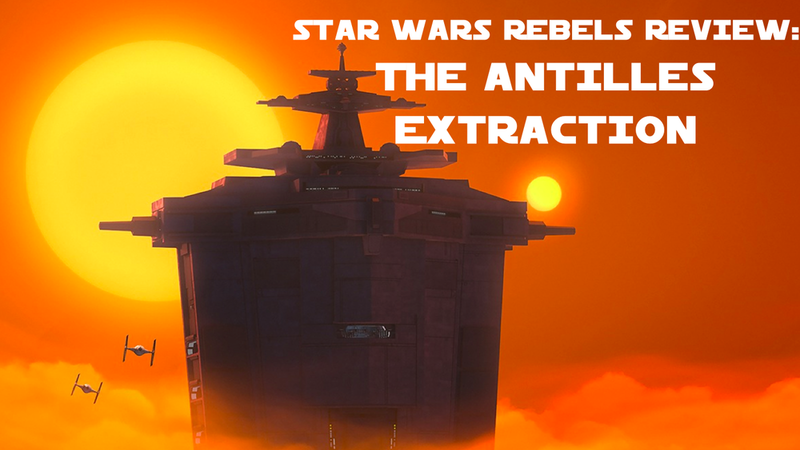 What Worked In The Antilles Extraction? What I believe gets taken for granted far too often in the Star Wars universe is the visual impact of the settings. While there may be controversy between generations about the quality of the original trilogy and the prequels, it must be acknowledged that the prequels took us places the original trilogy did not. There were reasons the original movies took us to Tatooine, Hoth, Dagobah, and the forest moon of Endor while the prequels took us to Naboo, Coruscant, Kamino, and Geonosis. Newer technology allowed us to visit more sophisticated places, doing justice to the original concept art of Ralph McQuarrie. The creators of Star Wars: Rebels have acknowledged McQuarrie’s influence. Because this is admittedly an animated series targeted at children, it may seem silly to admire the beauty of some of the artwork. However, I must mention the image of Skystrike Academy with the backdrop of a double sunset is gorgeous. It speaks to the talent and dedication of the artists who worked hard for images that last only a few seconds on screen. Not as beautiful but equally impressive is the darkness of the animation inside Skystrike Academy. The intimidating black uniforms of Imperial pilots and overall darkness of the interior of the academy symbolize the difference between the attractive exterior the Empire wants to show its citizens and the dark heart of its leadership and enforcers. Continuing on the visual front, the different TIE ships were great to see. The usual TIE Fighters are fine, but the TIE Interceptors look very impressive. They are possibly my favorite ship in Star Wars. The TIE Bomber, although not as cool, appeared to fit the job for which it was designed, carrying bombs and taking fire. Several plot points worked well in this episode. What is communicated clearly is that the Rebellion is on the raggedy edge. The lack of soldiers and pilots has them spread thin. The crew of the Ghost is split among different tasks to support the overall alliance. It also demonstrates why a mission to help defectors is so crucial. On the subject of the precarious position of the Rebellion, we see in this episode that being against the Empire can often have fatal consequences. This adds a reality to the series. It also makes us wonder if all the main characters will survive the entire run of the show. We also learn that there are several individuals working as spies within the empire, and they are all working under the codename Fulcrum. We may be given insight into the identity of one of those people as we see a payoff from last season’s episode, “The Honorable Ones.” Only time will tell. Sabine had time to shine. She sees a majority of the action, and we are reminded she is not a damsel in distress. Absent facing a force wielding foe, Sabine is a formidable warrior and can be called upon to rescue others. What Didn’t Work In The Antilles Extraction? The biggest disappointment is the continued absence of Grand Admiral Thrawn. The emphasis on the losses the Rebels have had recently would have been accentuated if Thrawn had been responsible for them. Thrawn was brought in to turn the tide against the Rebels. Now that it is turning, it would be nice to see him get the credit. One minor problem was how easily and quickly Sabine discovered the defectors while she was undercover. If it was that easy for her, Imperial agents could have found them also. However, I understand the need to get much done in a small amount of time. As the pacing of the episode was very good, I understand why she had to find the defectors so fast.